This form will send your issue to our online store provider FastSpring. This is the first thing you should do. This form will not send your issue to us and this is correct, as the payment process is controlled either by your card provider, PayPal, or FastSpring, all of whom are independent from us. Please make sure that that you enter correct details when placing the order. 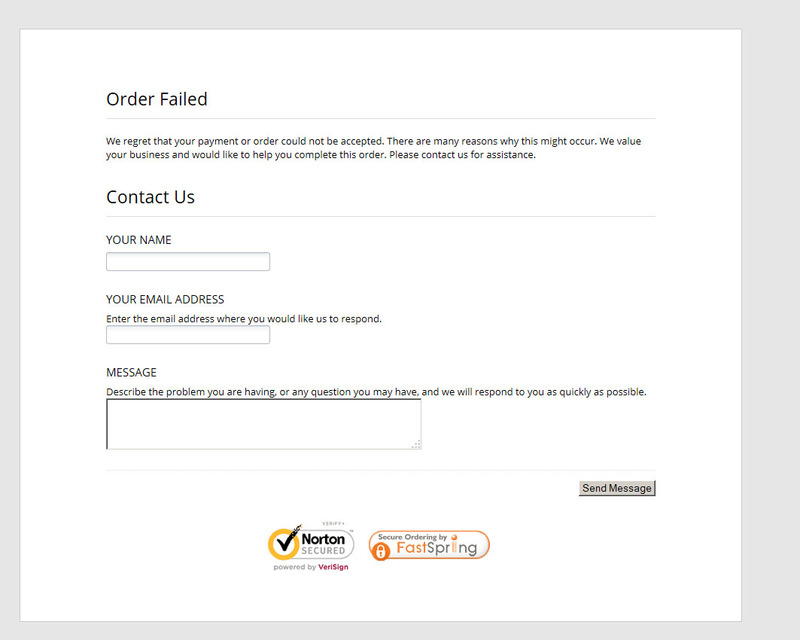 Entering even partially incorrect details may cause your order to be rejected by the payment system. Solution: If you suspect that you might have made a mistake in any of the above details, please try submitting a new order. It is recommended to close all browser windows and start with a fresh browsing session before submitting the next order. Using a different browser may also help. Solution: If this is not caused by your error, then you will need to contact your bank or credit card issuer (Visa, MasterCard, American Express, etc.) to determine what might be causing this problem. 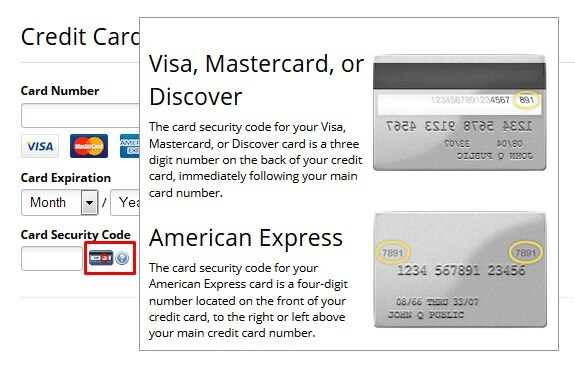 Read more about card security codes. Another possible reason for the decline by the credit card company is that there is a fraud hold on the credit card, which happens sometimes when the credit card company sees a transaction they do not believe fits with the customer's normal buying pattern and they worry that it might be fraudulent. Solution: contact your bank or the credit card issuer (Visa, MasterCard, American Express, etc.) to determine what might be causing this problem. Please check if your card has Internet transactions allowed. There may also be restriction placed on it by the credit card company that it may not be used outside of your country. To purchase our products, you need a credit card with transactions to USA allowed. Please make sure that you have sufficient founds on the account you are paying from. Note: depending on the case, the charge may be with tax included, or without it. Therefore it is best to have about 25% more funds on the account than the price of the product. The tax is added for all orders submitted from European Union, unless a valid EU VAT ID is provided by the customer. Solution: in such case, you will either need to contact your bank and have them increase the spending limit for you, or do it yourself in your online bank account settings. Paying from a different country than the credit card is registered in. Solution: sometimes the system may block payments which are performed from a location far away from where the credit card is registered. In such case you should contact your bank and explain them that you are abroad. You may also need to contact FastSpring for more details. Please make sure that the credit card you are using for the payment is still valid. Note: if you have recently activated a new card, the old one will most probably be deactivated even though the expiration date may suggest it's till valid! Solution: Contact your bank to find out what went wrong. PayPal problems may sometimes mean that there is a problem with the credit card associated with the customer's PayPal account. In such cases, the above (credit card) problems and solutions apply. Solution: please contact us by submitting a support ticket, and we will contact PayPal on your behalf if it's possible. Sometimes the customer has to contact PayPal himself, as PayPal provide some information to the account holder only. 3. I wasn't able to finish the order, but the money from my account disappeared! If a charge has appeared on your credit card, even though the order itself was canceled or failed - this is the so called "pre-authorization charge". It is temporary, and this action is performed by your credit card issuer. We, or our online store provider FastSpring, have no control over this process. The charge usually disappears within 5-10 business days. 4. I want my VAT back! What should I do? Do not cancel your subscription and contact us as quick as possible. First, check the solutions suggested above - correcting mistakes, contacting FastSpring and card provider/PayPal, re-submitting the order with a fresh browser session or using a different browser. If none of the solutions work, you should contact us from the e-mail address to which the new license should be assigned, additionally providing the failed order number. We will try to sort out the problem manually, or prepare another payment link. If you wish, we can also contact FastSpring on your behalf. If we cannot help you with placing the order via our website, the last option is using a wire transfer. However, paying this way usually takes more time, so we recommend buying the license sooner than at the last minute. If you decide to pay using this option, please contact us. I have made a mistake when placing the order!